What Is Talent Relationship Management? With the constant developments and changes in the world of recruiting, It’s hard to keep up with all of the new lingo. One of the latest terms is talent relationship management and if you’re not quite sure what that means, don’t worry. We’re here to give you the breakdown on what talent relationship management is, along with all of the most important details on this topic. Talent relationship management (TRM) is the act of managing your relationships with talent both internally and externally. It consists of building a relationship with candidates before they apply for a job, after their application, after their interview, and after they’ve accepted the job. The purpose of talent relationship management is to get a step ahead in the increasingly competitive war for talent. By building meaningful relationships with qualified candidates, you will have the advantage when it comes to recruiting them. The most important part of TRM is staying in touch with the candidates. With the continued development in recruiting technology, the best way to do this in today’s digital world is through a software. What kind of software do I need for TRM? TRM usually involves a recruiting software that maintains these relationship through various tools such as talent pools, email nurturing campaigns, sourcing, employer branding, and automation. Typically, this is done in combination with an applicant tracking software, which handles more of the administrative hiring tasks like posting job ads, CV parsing, and data entry. A good talent relationship management recruiting software is focused on automating relationships, making them easier and faster to maintain. For example, it should be possible to send out a notification email to all of the candidates who applied to a certain position. Or, it should be easy to send out a monthly newsletter to those in your talent pool. 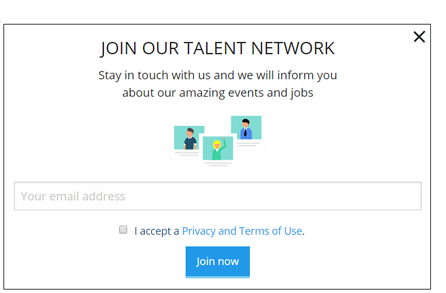 Speaking of talent pools, your recruiting software should also include a talent pool so that you can stay in contact with everyone who is interested in working at your company. TRM can mean maintaining both internal and external relationships. For external relationships, this means all of the interactions before a candidate is hired and is focused on building a positive new relationship. Internal TRM is more about maintaining a positive relationship once a candidate becomes an employee and deals with the internal application process. You may have also heard the term candidate relationship management (CRM). Talent relationship management and candidate relationship management are quite similar in terms of their goal of creating lasting relationships, but they do have some differences. One of the main difference between TRM and CRM is that CRM is solely focused on current candidates and typically does not involve the relationship past the hiring process. How can I implement talent relationship management into my recruiting process? Would you like to learn more about talent relationship management? 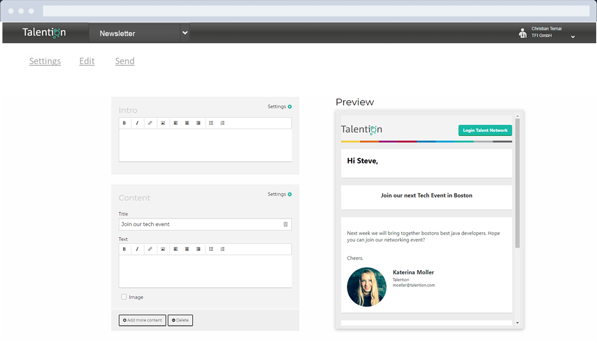 We will gladly show you further best practice examples and how you can implement TRM with the Talention software. You can request a demo here and someone will get in touch with you shortly. Request a demo now. Check out our page "The Ultimate Guide to Candidate Relationship Management" to find further resources on the topic of talent relationship management and CRM.